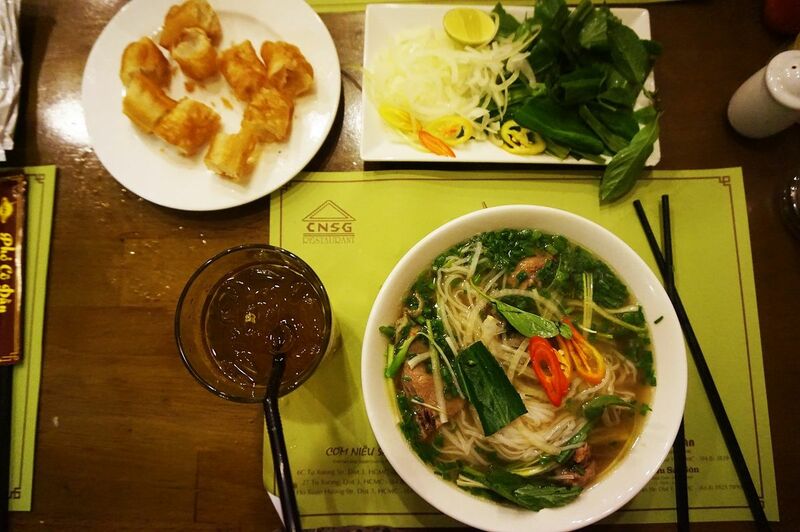 A Taste of Vietnam – Phở & Co.
Vietnamese food is as rich as its culture and has lots of diversity and influences. This includes a great balance of sweet, sour, spicy and fishy tastes and aromas that make up a very interesting mixture. The food typically consists of rice in various forms such as sticky rice, rice noodles or steamed rice. Alongside you find a whole bunch of herbs (cilantro, lemongrass, mint and basil) that gives the food its typical freshness. Another important ingredient to Vietnamese food is the fish sauce, nước mắm, a pure and very pungent nectar of fermented fish. The condiment to many dishes is nước chắm, made of fish sauce, lime , chilies and garlic. Quite a distaste to the western savor but a very crucial component to Vietnamese food and mostly used in marinades, dips, broths or dressings. Seafood is commonly used but so is pork, beef and chicken. All these ingredients are then completed with some borrowed flavors from its neighboring countries such as China, Thailand, Laos and Cambodia. Additionally, the former French colonization left its marks in the Vietnamese flavors as well. 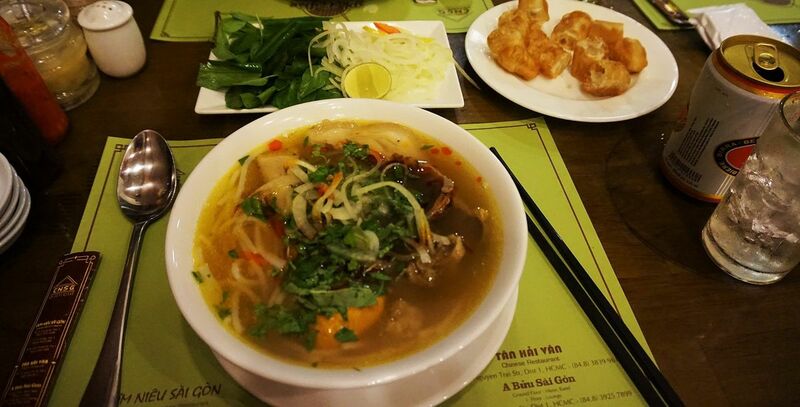 Our first taste of Vietnam started with two dishes: One was that of a rich soup named Bún bò. 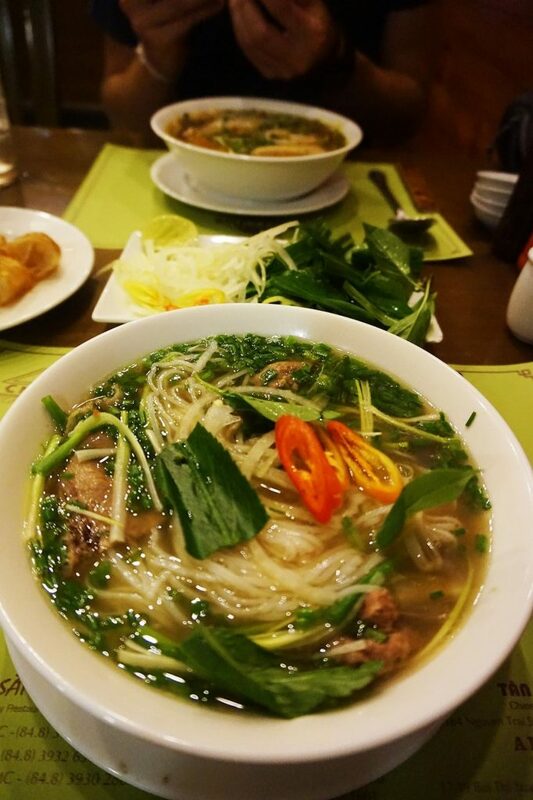 Originally from the city of Huế this soups contains of vermicelli noodles, thinly sliced and marinated beef shanks served with lime wedges, fresh mint and basil and raw sliced onions – a true delicacy! The second dish was a classic Phở Bò, a traditional Vietnamese noodle soup consisting of sliced beef, bean sprouts, lime wedges, fresh greens such as basil, cilantro and mint, and onions. It is defined by a broth, flavored differently depending on whether its from the north (more clear) or the south (a bit murkier like the first two pictures below). It is THE staple food in Vietnam and can be found throughout the entire country. All soups are then punched up with some fish sauce, spices, herbs and other garnishes. Soups make up a large portion of Vietnamese food and are especially popular for breakfasts. 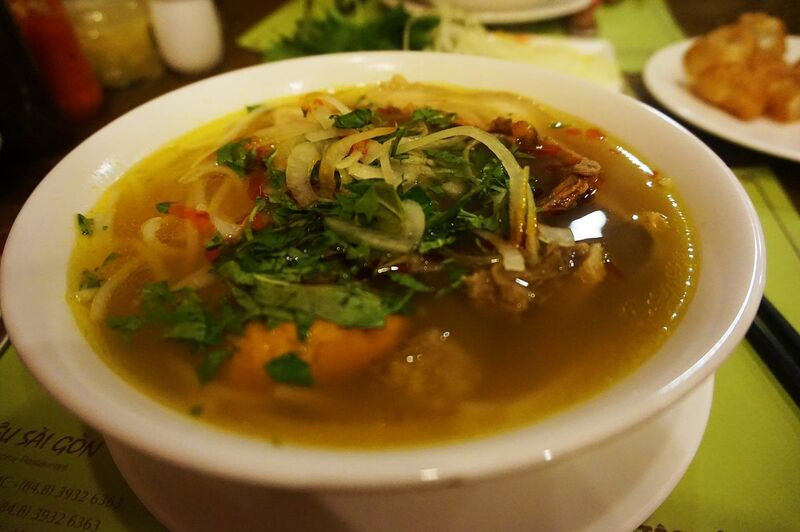 There are numerous varieties and forms of noodle soups in Vietnam and each one has its distinct taste and origin. Essential for all soups is the broth – this is what distinguishes a soup from a very good soup! 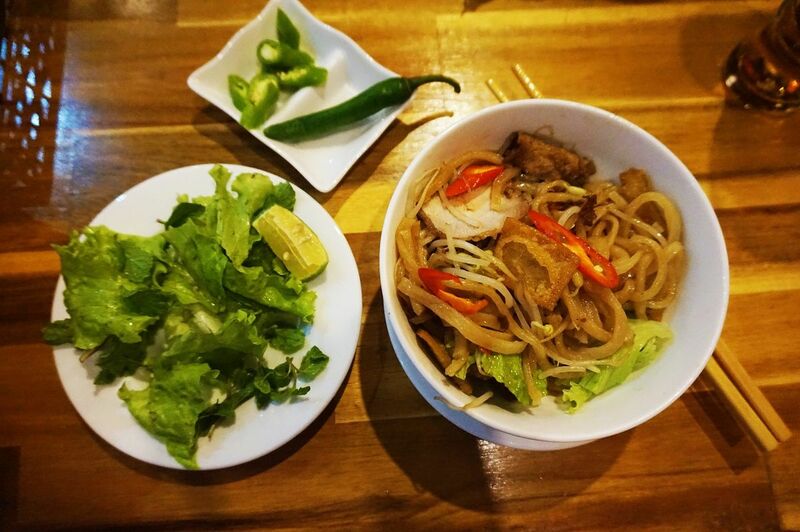 But of course there is more to Vietnamese cuisine than just soups. 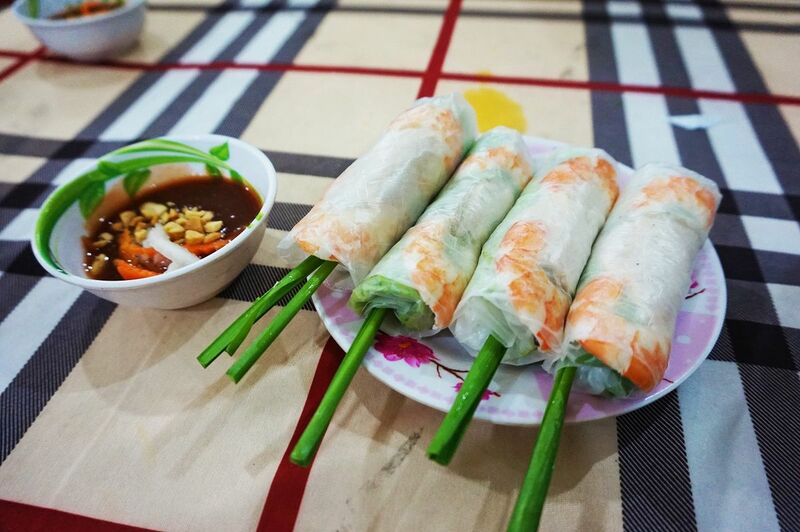 Another common dish are the spring rolls, Gỏi cuốn. These rolls are not fried but are rather transparent roll filled with lots of greens, meats or seafood and fresh herbs. Alongside to any spring rolls you get different dips – in our case we got a peanut dip. A very good starter for any meal and very tasty. 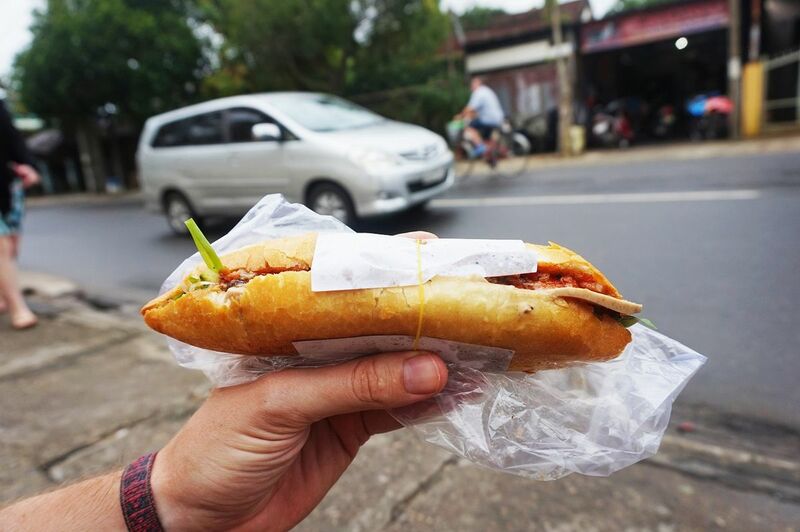 The French influence can be most prominently seen in the Bánh mì, a crusty baguette made with different fillings such as pork, meatballs, sardines, pickled carrots, cilantro and various other toppings. The Vietnamese have taken the baguette and made a totally new flavor out of it – we really enjoyed eating these. The mix of french baguette and Vietnamese flavors is absolutely fantastic – spiced up with lots of chilies we just could not stop eating them! One of the simplest yet tasteful dishes we tried in Vietnam also happened to be home to our favorite town in Hoi An. 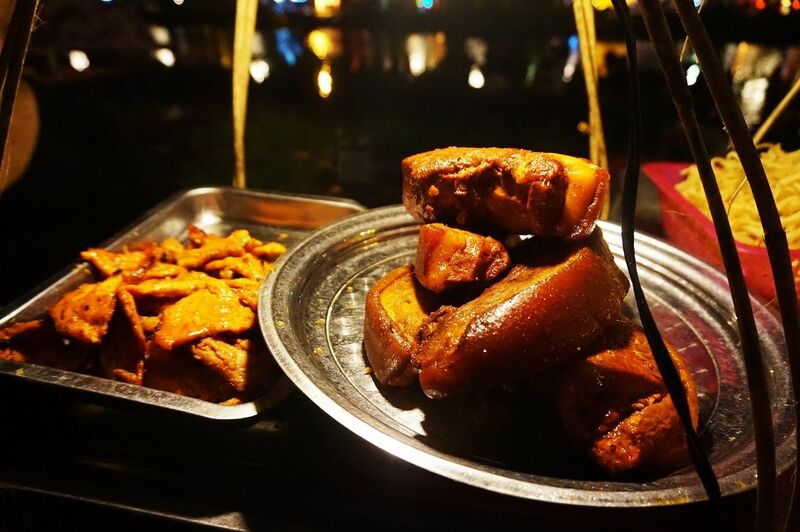 Although also found throughout the entire country it is a meal very unique to Hoi An and is called Cao lầu. This dish is made of special noodles from town along with some pieces of crispy pork (so good! ), served with a little broth, fresh herbs (obviously), and bean sprouts. It is then typically served with some salad. We ate this meal at a rather inconspicuous little joint next to the river where we could see how the pork is fried. Absolutely recommendable when visiting this beautiful town. We discovered all these foods as we traveled our way through the country, exploring new regions and trying to catch up as much local dishes as we possibly could. Sometimes the smallest and low-key places were the ones that surprised us the most and made us appreciate this cuisine a lot. Coming back to the roller coaster ride of tastes mentioned earlier we must admit that not all food was as delicious as the ones mentioned above. We loved to stroll through the markets and streets to find more savory treasures of this diverse cuisine and were able to do so, but maybe not as often as we might have hoped. Yet, the treasures that we did end up finding positively surprised us and really displayed the rich taste that we so very much were looking forward to. In total we did enjoy Vietnamese food a lot and appreciated the flavors, scents and freshness of all its dishes.